Plant of the Year: KCP&L’s Iatan 2 Earns POWER’s Highest Honor - Automatic Systems, Inc.
Posted January 26th, 2018 by Martin Knowles & filed under In the News. Automatic Systems Inc. supplied the fuel- and material-handling equipment and was responsible for its installation. KCP&L, headquartered in Kansas City, Mo., serves about 820,000 customers in western Missouri and eastern Kansas. Great Plains Energy Inc. is the holding company of Kansas City Power & Light and KCP&L Greater Missouri Operations Co. (GMO, the former Aquila, purchased in July 2008). However, KCP&L is the brand name used to represent both of these utilities. KCP&L has an installed capacity of approximately 6,700 MW. 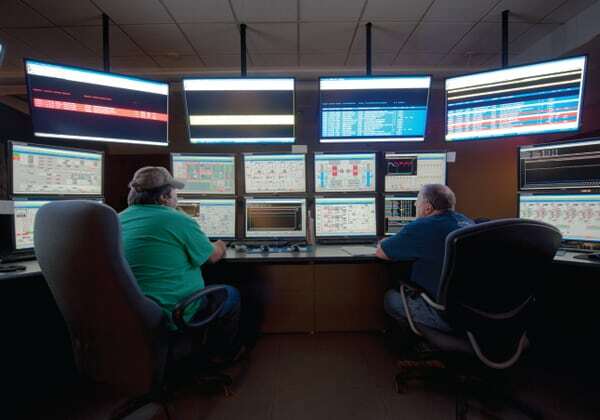 Its coal-fired Iatan Station, located about 30 miles northwest of Kansas City, near Weston, Mo., features the recently renovated approximately 700-MW Unit 1 and the 850-MW (net) Unit 2, which went into service in August 2010 (see Table 1). 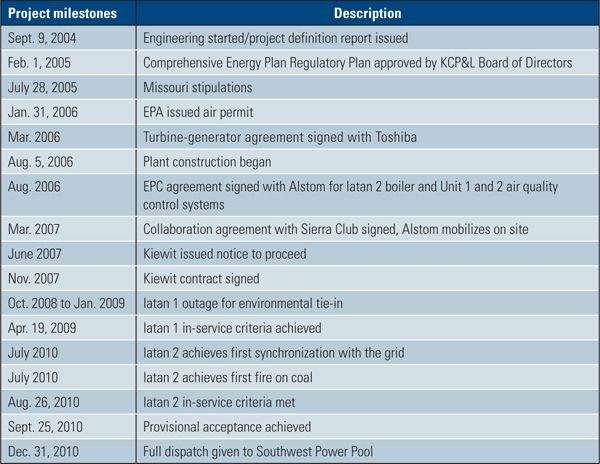 Iatan 2 (Figure 1) was KCP&L’s first new baseload plant in nearly three decades. In addition, this milestone marked the finale of KCP&L’s Comprehensive Energy Plan (CEP), initiated seven years earlier. The plant is named after Iatan, a chief of the Otoe tribe that fought battles with the Comanche (also called Iatan) around 1800. 1. Latest and greatest. The Iatan Generating Station is located on the banks of the Missouri River in western Missouri. Commercial operation of Iatan 2 in December 2010 added 850 MW to the approximately 700 MW produced by Iatan 1. Iatan 2 was the first new baseload power generator installed by KCP&L in nearly 30 years. In 2003, KCP&L began updating its energy development plans to meet expected regional demand growth for itself and its project partners. The goal of the CEP was to add needed baseload capacity while lowering the utility’s overall emissions by strategically adding renewable energy projects and investing in energy efficiency, a synergistic package of improvements benefiting all stakeholders. KCP&L’s fuel mix is about 80% coal, 17% nuclear (Wolf Creek Generating Station was the last baseload generation built, in 1985), 2% natural gas and oil, and 1% wind. Downey also noted that portions of the CEP proposed financial processes that would allow the utility to maintain credit metrics throughout the construction process given that Missouri regulations do not allow construction work in process to be added to the rate base. The KCP&L cost analysis concluded that, from a baseload generation perspective, coal-fired generation still enjoys a significant cost advantage over other generation technologies, even when considering the cost of meeting challenging emissions-reduction goals. 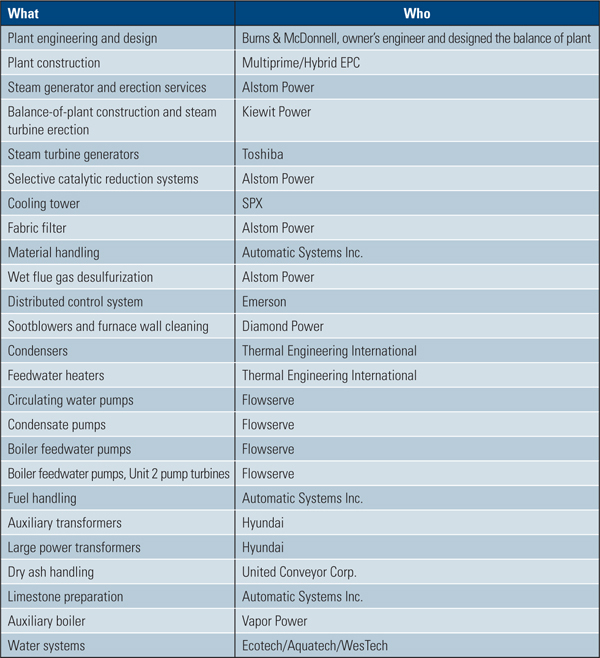 Many utilities approach resource planning as a euphemism for building a new plant, regardless of the public’s support. KCP&L’s CEP took a radically different approach to gaining acceptance: It took the story directly to the public. The theme of the message was, “This is how we see our building evolving over the next decade or more, and here is our strategy for balancing projected demand for electricity with a sustainable environment.” KCP&L hosted community workshops to explain and discuss all aspects of the plan, listen to consumers and their concerns, and feed that information back into the CEP development process. Similar discussions were held with regulators and Wall Street financial representatives, who critiqued the plan and suggested improvements that would reduce risk to ratepayers and stockholders. The CEP was approved by Kansas and Missouri regulators in 2005 with the plan that Iatan 2 would be online in the summer of 2010. This isn’t to say that KCP&L’s early planning process didn’t meet with strong opposition. For example, Iatan 2 was sailing through the regulatory approval process when the Sierra Club and Concerned Citizens of Platte County intervened in the Prevention of Significant Deterioration permit process in late September 2006. After several procedural moves, KCP&L and the other litigants negotiated an agreement that fulfilled the public’s desires, as expressed in the CEP, and addressed the interveners’ environmental concerns while ensuring that the utility would be able to meet its expected demand growth. The Collaboration Agreement, signed in March 2007, gained KCP&L’s agreement to offset an estimated 6 million tons of CO2 emissions each year, add 100 MW of wind power by 2010 (which was already under development), and add another 300 MW of wind supply by 2012—the amount of wind capacity the utility believed was prudent given wind’s variability. The agreement also included investment in energy-efficiency projects to reduce demand by 100 MW immediately, plus another 200 MW reduction by 2012. (KCP&L implemented 15 residential and commercial customer energy-saving pilot programs to meet this goal.) Mobilization of the construction site began shortly after this agreement was signed. The Sierra Club described the result of the negotiation “a groundbreaking agreement that can serve as a model for environmental groups and utilities working together.” You may recall City Water, Light & Power, the municipal utilities agency of the City of Springfield, Ill., negotiated a similar agreement to allow its Dallman 4 project to move forward. 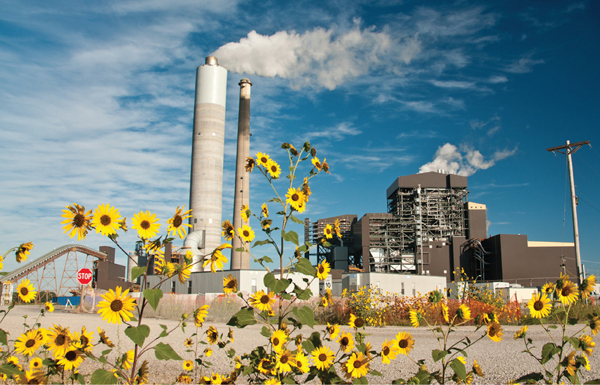 Dallman 4 was POWER’s 2009 Plant of the Year (see the August 2009 issue in our online archives at www.powermag.com). 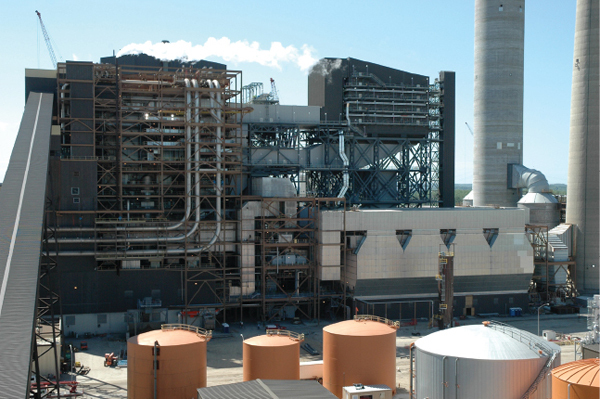 In 2007, $81 million was invested in an SCR system that reduced NOx by 87% at the utility’s La Cygne plant. About $265 million was invested in wind and energy efficiency/demand reduction projects. The balance went toward the $2.4 billion price tag of the construction costs for Iatan 1 environmental retrofits, the construction of Iatan 2, and Iatan common facilities. Output from the 850-MW Iatan 2 is owned by a consortium of utilities and power distributors. 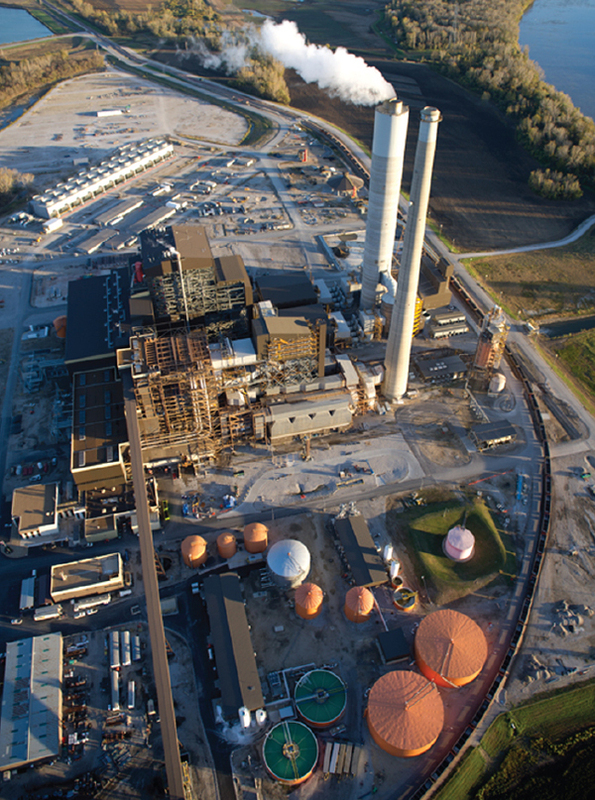 KCP&L and its affiliate KCP&L GMO own roughly 73% of the new plant; Empire District Electric owns 12%; Missouri Joint Municipal Electric Utility Commission owns 11.76% (equivalent to 100 MW); and Kansas Electric Power Cooperative owns 3.5%. KCP&L and GMO own 88% of Iatan 1. KCP&L is the plant operator and responsible for routine maintenance. Approval of the CEP by both the Missouri Public Service and Kansas Corporation Commissions cleared the regulatory road for construction of Iatan 2, although KCP&L had began construction of the environmental upgrades for Iatan 1 the previous August. Construction started on Iatan 2 in September 2007. Earlier that year, KCP&L had awarded a fixed-price contract to Alstom Power to engineer, design, and construct the boiler island, including the air quality control system (AQCS) for both units. The steam turbine was purchased from Toshiba. Burns & McDonnell was retained to provide engineering design services for both projects (Table 2). The supercritical Iatan 2 boiler, Alstom’s largest sliding pressure boiler in the U.S., was designed to burn low-sulfur Powder River Basin coal with low-NOx tangential burners. “Iatan 2 will be approximately 10% to 12% more efficient than a typical plant built in the 1970s,” says Burns & McDonnell project manager Bob Reymond. “The state-of-the-art emissions control systems will remove about 98% of sulfur dioxide from the exhaust.” The post-combustion AQCS begins with an SCR, fabric filter, and wet flue gas desulfurization (wet FGD). Activated carbon injection (ACI) was also added to the AQCS suite of equipment for mercury emissions reductions. The permitted levels of mercury emissions are based on site emissions, thereby giving operators some discretion in how much activated carbon is injected into each unit (Figure 2). For simplicity of common operating practices and cost-effective purchasing, the entire post-combustion AQCS for Iatan 1 is virtually identical to that of the new Iatan 2. Today, the NOx emissions of both units are 53% lower, and SO2 emissions are 74% lower, than those of only Iatan 1 prior to the AQCS upgrades. 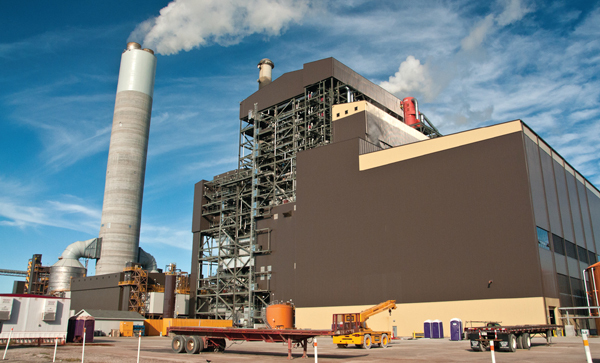 Using high-efficiency supercritical combustion technology also contributed greatly to the utility’s CO2reduction goals, as higher combustion efficiency means less CO2 is produced per ton of coal consumed. KCP&L continues to make focused investments in initiatives with the goal of improving the operating efficiency of its coal fleet 3% by 2013. Iatan 2’s sliding pressure boiler mode of operation also helps the plant meet the design goal of being capable of performing daily load swings from 40% to 100%. 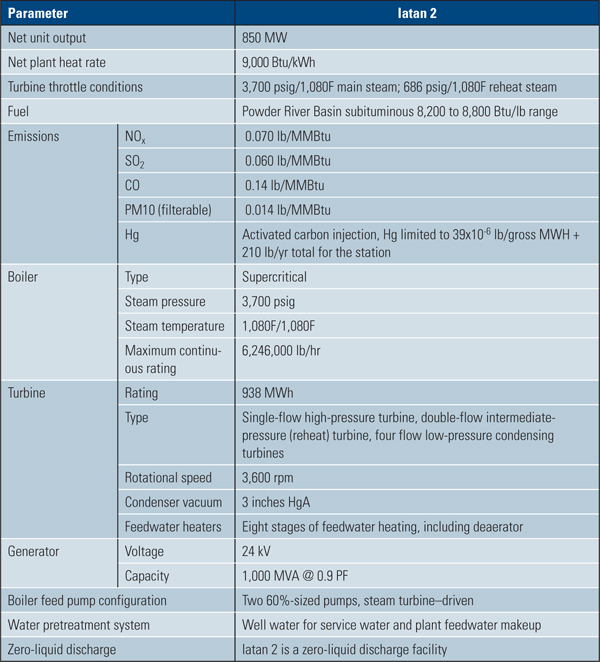 Of particular interest in the project technical specifications (Table 3) are the main and reheat steam temperatures, which are both 1,080F—more aggressive than the typical 1,050F of similar supercritical plants. Recent reports from the plant confirm that plant operation has been very stable with these near-state-of-the-art steam temperatures. 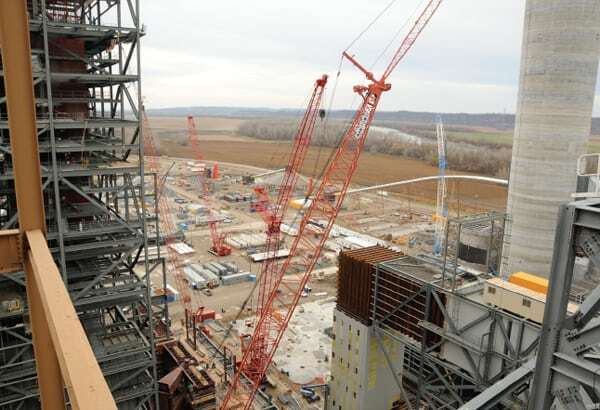 Once the long-lead equipment purchases were completed (over $1 billion by August 2006), KCP&L made inquiries with experienced power industry contractors to assume the project lead but found little interest in constructing the plant on a turnkey basis. 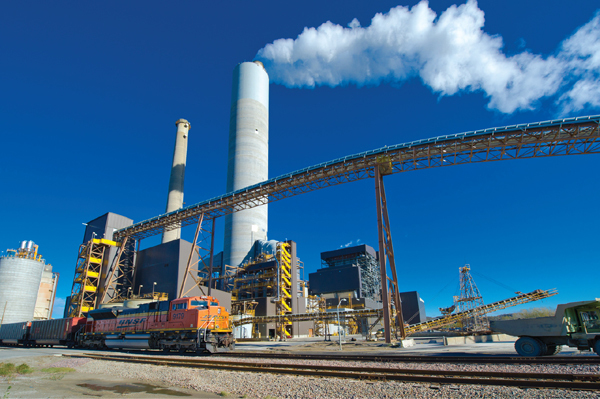 The challenge for contractors at the time was the rapidly increasing cost of commodities such as copper and steel plus nationwide high demand for limited journeyman construction talent for constructing new coal plants and retrofit AQCS systems. KCP&L decided to proceed with the project using a multi-prime approach combined with aggressive purchasing processes to limit the risk of future price increases. In essence, KCP&L would assume the responsibility and risk of the general contractor by using seven or eight smaller contractors to complete the balance-of-plant work on Iatan 2. Alstom mobilized onsite to begin its work on boiler erection shortly after signing of the Collaboration Agreement. Fortuitously, the cancellation of another large project opened up the work schedule of Kiewit Power, a very experienced prime contractor in the power industry. 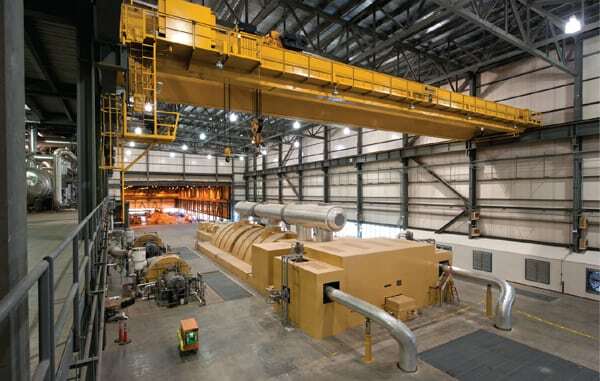 Kiewit Power was subsequently selected as the contractor responsible for all balance-of-plant construction, construction interface with the boiler island, and assembly of the steam turbine generator. The design of several plant systems deserves particular note given their unique approach for solving sticky problems, often with a simple solution. Coal- and Ash-Handling Systems. Coal is delivered to the plant by BNSF railroad by one or two unit trains each day. The coal is dumped through a single rotary car dumper and delivered by a stacker reclaimer, a system that has proven its reliability since Iatan 1 was put into service. The design of Iatan 2 added a parallel stackout pile with the capacity to handle the coal delivered by two unit trains. Also added was a second delivery conveyor to Iatan 1 to match the redundant conveyors installed on Iatan 2. When operating at full load, each unit consumes about 10,000 tons a day, the equivalent of about one and one-half unit trains each day. The conveyors are fully enclosed and have a considerable number of dust collection stations, including the transfer towers (Figure 3). Automatic Systems Inc. supplied the fuel- and material-handling equipment and was responsible for its installation. The coal pile, sized to about 50 days’ storage (about 1,000,000 tons) is managed using rubber-tired vehicles. The size of the stockpile at any time is usually determined by external factors, such as the projected conditions of the rail after flooding in the Missouri River basin. Iatan 2’s dry ash system, part of KCP&L’s commitment to eliminate ash ponds and wet ash sluicing at Iatan, required construction of a new dry ash landfill with the requisite liners and leachate collection and monitoring systems to ensure that any water collected does not seep into the ground, particularly from rainfall and drainage. Iatan 1 was also retrofitted from wet sluice bottom and fly ash to dry ash. Portions of the bottom dry ash are sold for construction materials, particularly as an additive in cement products, although the rate of sale closely follows construction demand. Gypsum from the wet FGD system is transferred by truck to the dry ash landfill, located only about 2 miles from the plant. Unsold fly ash is also transferred by trucks from each unit’s ash silos to the landfill. Unlike other plants with mercury control, ACI carryover into the dry ash has been minute and has not affected ash sales. As part of the permitting process, KCP&L committed to regulators that Iatan would become a zero–liquid discharge (ZLD) plant. KCP&L assigned the task to engineer and construct the ZLD system to Burns & McDonnell. The conceptual approach was to minimize wastewater production by using evaporation followed by spreading the remaining concentrate on the fly ash, a much less expensive and much more reliable approach than using a conventional crystallizer and solids disposal. Essentially, the ZLD system takes all concentrated waste streams from plant processes and either reprocesses the water for plant reuse, or the surplus brine produced is used for ash dust control. The Burns & McDonnell system is simple yet very effective. Water supply to the plant is much more complicated than merely drilling a well and dropping in a pump. Instead, another simple, yet inspired approach was taken. A vertical caisson collector well was placed into the sandy ground and sunk about 100 feet deep near the Missouri River. Operating opposite of the common septic leech field, a drain field was installed below the river water level. The effect is that river water is collected in the underground collector well through the equivalent of a massive sand filter. Clean water is collected and pumped to the plant using 10,000-gpm pumps, with a maximum of 14,500 gpm possible. By taking this approach to collect makeup water, the entire matter of water withdrawals avoids the expected requirements of the upcoming revisions to the Clean Water Act Section 316(b). Makeup water is subsequently clarified and used as supply water to the wet FGD or goes through further treatment before being used as boiler makeup water. Air Quality Control Systems. On the exhaust gas side of the plant, similarly sized air quality systems supplied by Alstom Power were installed on both Iatan units. NOx emission limits are based on a 30-day rolling average, giving the plant some operating flexibility. The boilers have proven capability to operate with NOx levels in the 0.055 lb/million Btu range, well within the permit limit of 0.070 lb/million Btu (see Table 3). The plant has experienced little problem with ammonia slip. The baghouses on both units are essentially identical, although Iatan 2 uses 25,000 bags while Iatan 1 uses slightly fewer and is outfitted with four fewer compartments than Iatan 2. Opacity permit limits are set at 15%, although the plant has operated reliably in the 1% to 3% range. The wet FGD systems, using the same size vessel on both units, routinely operate at 99% removal, producing SO2 levels in the exhaust gas well below the 0.06 lb/million Btu permit limit. Each vessel is equipped with five recycle pumps but usually runs only three or four, depending on operating conditions. There are other common systems at the plant, such as the wet FGD reagent preparation equipment. In addition, the stack was constructed to enclose the stack gas exhausts from both units (Figure 4). The ammonia preparation system, common to both units, uses truck-delivered normal aqueous ammonia and a common large storage tank. Another common system is the No. 2 diesel fuel system used for boiler startup; adding another system for Iatan 2 triggered new and expensive requirements, so the single system does double duty. Steam Turbine System. A unique feature of Iatan 2’s design is the ability to peak the output of the plant while not burning any additional fuel. The steam turbine system is designed with five feedwater heaters on the low-pressure side and three on the high-pressure side (Figure 5). The top feedwater heater on the high-pressure side is designed to be closed, thereby taking the feedwater heater out of service. In this circumstance, the turbine extraction steam instead travels through the steam turbine to produce more power, up to 40 MW. However, this additional power doesn’t come without a cost. The additional steam flow to the condenser, after passing through the steam turbine, produces lower feedwater temperatures and therefore suboptimal performance conditions at a constant fuel flow. This off-design operation results in a reduction in the plant heat rate of 100 Btu/kWh. No question this is cheap peaking power—a motor-operated valve costs much less than a 40-MW gas turbine. Downey believes that KCP&L’s oversight of the project played a key role in the successful and on-time completion of Iatan 2. The project team was augmented by experienced project consultant Burns & MacDonnell and an executive oversight committee (EOC) joined by experts from the law firm of Schiff Hardin, specialists in energy law; construction contracting; and management of large, complex construction projects. The project team was responsible for the overall integrated project schedule and tight management of contractors on the job site. The EOC, also with representatives on the job site, served as an independent voice reporting directly to Downey. The EOC, augmented by the company’s legal, regulatory, and other senior company leadership, was responsible for producing the 18 quarterly reports to the Kansas and Missouri commissions and for preparing regulatory testimony at the end of the project to justify the project schedule and expenditures. Downey said that the prime rule on the project was total transparency in all actions taken by all team members. The project team, led by Bob Bell, senior director of construction, was given much flexibility to deal quickly with emerging business issues. One change discussed earlier was the switch from direct contracting to selecting Kiewit Power to manage the balance-of-plant portion of the project, a decision that paid dividends over the course of the project. To many, the relatively deep involvement of the EOC in the affairs of the project would be a source of friction. Instead, this EOC was very supportive of the project team and able to make decisions quickly when the project ran into hard spots, because its members were always up to speed on the business side of the project. A good example of the function of the EOC was the mediation process used. If a contractor believed a scope change was warranted, the documentation was to be submitted immediately rather than being held until the end of the project. If the project team and the contractor were unable to reach an agreeable resolution on the contractor’s claim, then an outside mediation process was required to vet the disagreements, be a sounding board to challenge both parties, and reach a conclusion. Another major challenge for the project team, according to Davis, was the overall project schedule integration. At the peak of construction, there were up to 4,000 people on site at the same time in a very constrained work area (Figure 6). The KCP&L construction management staff peaked at 200 people, including those responsible for monitoring project costs and schedule, quality control, and inspection. However, site logistics were difficult when the AQCS upgrades on Iatan 1 and the boiler construction of Iatan 2 were fighting for worksite space, especially during the period from the fall 2008 Iatan 1 outage to connect up the AQCS through the late summer of 2009. Maintenance for the entire plant is conducted by a single department, though the operators are assigned to a particular unit. Common equipment between the units is operated by more junior operators. Until recently, each unit had a separate control room, but this spring, the control rooms were integrated into a single space, a move that has paid dividends with increased teamwork. On Iatan 1, the old Bailey I90 system was replaced with new digital controls supplied by Emerson (Figure 7), virtually identical to those supplied for Iatan 2. (The older unit is a subcritical unit; Iatan 2 operates at supercritical steam conditions.) The old Iatan 1 control room will not go to waste, however. KCP&L has purchased a high-fidelity simulator for each unit that was used for operator training and testing purposes prior to startup of each unit. (The operators were put through a training regimen using not only the simulator but also other vendor-supplied training before startup began.) These simulators are scheduled to be installed in the old control room with the goal of reproducing the look and feel of the actual control room, enhancing the operator training process. The startup of Iatan 2 was, well, mostly uneventful. This lack of drama was attributed by Davis to the project team doing its homework. The team prepared risk assessements of the startup, ensured that operators had completed needed training, and dispatched myriad technical details before the day the unit was first synchronized to the grid. First fire in the boiler was on March 25, 2010, followed by steam blows on June 3, 2010—a suprisingly short time. First synchronization was on July 20, and coal was introduced to the boiler on the same day, an unusually quick process. In fact, the unit continued to run so well that all of the contract-required in-service criteria established by both state commissions were met on August 26, 2010. The project team resolved typical punch list items while the plant continued to run over the next three months. On December 7, 2010, Missouri Governor Jay Nixon dedicated Iatan 2 along with officials representing the plant ownership. The governor marked the occasion by flipping a switch that symbolically put the plant into normal operating mode. The plant was declared commercial on December 31, 2010, and released to the Southwest Power Pool for dispatch. Davis summed up his experiences, and surely those of the entire project team, when he said, “There are few undertakings in this industry more difficult and complex than constructing a coal plant.” He added, “Having been involved in the project from day one, I can proudly say that our execution in the construction and startup of Iatan 2 was world class.” We agree.